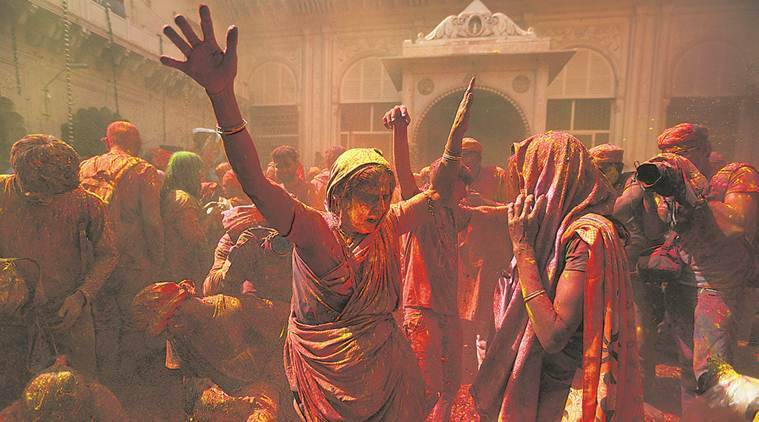 Sufism and Holi have been closely linked. Everywhere in the world, when a qawwali concert concludes, the space is filled with this Amir Khusrau piece, a tribute to his peer, Nizamuddin Auliya. A composition in raag Mishra Khamaj, a popular raga for thumris and tappas, it’s difficult to get past the version that Ustad Nusrat Fateh Ali Khan gave us. It is easy to be transfixed by the passion one hears in that voice, the ecstasy of the mood and the crescendo the notes create. Nusrat’s nephew Rahat Fateh Ali Khan and singer Amjad Sabri, too, had created another version of the piece in Coke Studio Pakistan. The same piece found resonance with singer Abida Parveen too, who it seemed saw the brightest shades of red when she closed her eyes while crooning the poem. In India today where even the smallest divide of religion, gender and community can spark reactions, the fact that colouring each other does not leave a trace of who you were, is worth remembering. While the festival of colours is associated mainly with Hinduism and the tales of Radha and Krishna, it has also been an integral part of Islam for centuries. 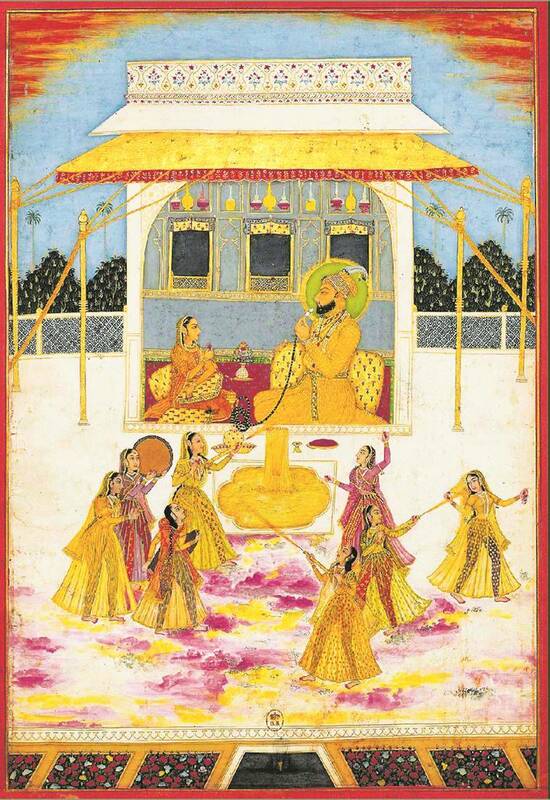 While there are references to Holi in most of the Mughal reign, they are very prominent in the times of Emperor Akbar, Jehangir and Bahadur Shah Zafar, who celebrated the festival as Eid-e-Gulab-Pashi, where colours were created with tesu and roses. Mir Taqi Mir, who was in the court of Nawab Asaf-ud-Daulah wrote in praise of Jashne-e-Holi. Wajid Ali Shah, the last Nawab of Awadh, who considered himself to be the embodiment of Krishna, is known to have celebrated the festival with much fervour. One time when Holi and Muharram fell on the same day, he made sure both festivals found attention at different times of the day. Shah wrote: More kanha jo aaye palat ke, ab ke hori main khelungi dat ke. This thumri not only found place in Vrindavan and Varanasi in the centuries that followed, but was in demand after thumri exponent Shobha Gurtu recorded it. Bollywood also immortalised it in Sardari Begum (1996). Another piece that comes to mind but hasn’t been a popular recording is Khelo re chistiyon Holi khelo, khwaja nijam ke bhes mein aayo (All the Chistis, play Holi; Khwaja (Moinuddin Chisti) has come in the disguise of the Nizam). A YouTube version of Munawar Masoom’s qawwali is doing the rounds. Somewhere in a village in Gujarat, under a tin shed packed with audience, Ahmedabad-based Osman Mir sings Mera murshid khele Hori, Yaara rang hai uska nyaara; Ishq da rang hai nyaara, Tere ishq da rang hai nyaara (My mentor plays holi, friend, his colour is unique; the colour of love is unique, the colour of your love is unique). Lyricist Niranjan Iyangar’s stunning poetry, paired with refrain from harmonium and claps, has the qualities of a classic. Based on raag Desh with touches of Adaana, the emotionally charged song with alaaps and refrains woven with the undercurrent of the tabla, takes us back to the original Shankar Ehsaan Loy, which has a unique whiff of the past, when everyone celebrated a festival together despite their gods and customs.